Should you have any comments or general feedback, please feel free to contact me. I value your opinion and am always looking for ways to improve the site. However, please understand that I can not always respond to emails asking me for individual advice or information about breeders, rescue or shelters in a particular area. The time I invest in responding to these individual emails necessarily goes at the cost of the time I feel I should invest in the maintenance and development of this website to provide ever more useful information that is valuable to ALL our visitors. Thank you for your understanding. I do read and appreciate all your comments and input, though, and over the years many of your emails have been the inspiration to write new articles. So, please do not hesitate to send me your feedback or comments. They are always very welcome ! We try to be as complete as possible in the information we provide on our web pages. However, please note that we can not provide on-line veterinarian consultation, so if you have specific questions concerning the health or behavior of your dog or puppy, please contact your breeder or veterinarian. In order to speed up processing of the photos and allow for an easier selection of the photos that will be posted, please specify for which page you are submitting the photos, in the subject line of your message (for example: bathing bulldogs, Christmas bulldogs, etc). For other breeds, please add the Breed in the subject line. I hereby want to sincerely thank all our visitors who have sent us all these kind and supportive messages over the years. Above all, I want to say a big 'Thank you' to those of you who have sent me all these wonderful photos of their Bulldogs. With the years the photo galleries have grown to such an extent, that I thought it was time to create a very special place for them, where our visitors could better appreciate the photos and more easily browse through the many photo galleries. That's why I have created FunnyFlatFaces.com, a website especially designed to collect all your (and our) best bulldog photos so that they can be viewed and enjoyed more easily. 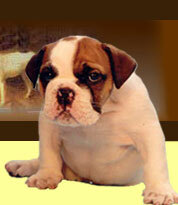 We have allowed some of our bulldog's flat-faced cousins and friends into the galleries, too. Please note that all photos submitted may be posted either on FunnyFlatFaces.com, Cutepuppies.Bulldoginformation.com or Bulldoginformation.com.